Daily Illuminator: GM's Day Is Coming! February 29, 2012: GM's Day Is Coming! Designed to celebrate the unsung heroes of the gaming table, GM's Day emerged nearly a decade ago over on the EN World forums. In recent years we've celebrated this day -- March 4 -- by releasing a new cache of classic virtual goodies over on e23. We're planning on doing the same again this year; even as I type, I'm putting the finishing touches on a new batch of digital delights. We're currently looking at uploading GURPS and Car Wars releases, but we're not 100% certain about those plans yet (do you know how hard it is to get all those electrons spinning in the right direction?). I've also been chatting with some co-workers about GMs and the art of gamemastering in general. It's been an interesting discussion, and I hope to share some of the high points here within the next few days. In the meantime, you can get ready for the holiday by reading (or rereading!) 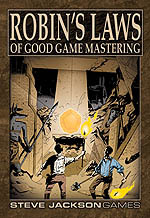 your copy of Robin's Laws of Good Game Mastering and talking about your favorite GM moments over on the e23 forums.